Thanks to Margaret Taylor for all her dedicated research on the First World War, without which many of these items would not have appeared. 2014 marked the centenary of the outbreak of WW1 and in Ellastone we had a display of photographs and other memorabilia with a local connection at St Peter’s Church. 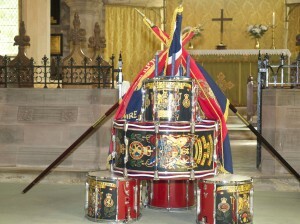 On 3rd August there was a procession led by the Staffs and West Midlands Cadet Force Corps of Drums. Twigs of rosemary were left at the memorial. This was followed by the Drumhead Service, a special service of remembrance. This is the title of a book researched and written by Paul Machen and Sue Smith from Sheffield. It is a record of those who are commemorated on the Brass Memorial Plaque in Church and those who died and appear on the Ellastone School Roll of Honour, but not on the Church plaque. 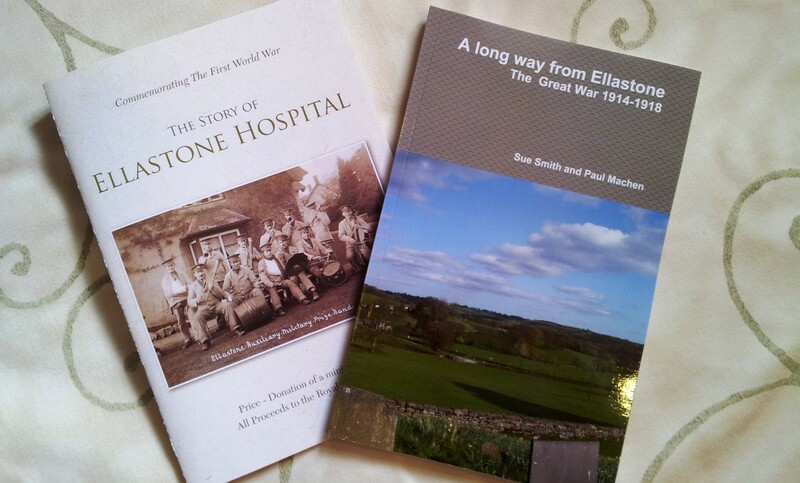 The book came out of Sue’s researching her family tree and finding three relatives listed as War Dead in Ellastone. Since then she and Paul have spent many hours finding out as much as possible about the men of the Parish who died in WW1. 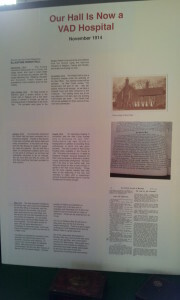 The book is on sale in Church for £4 or from Pam Shouksmith (324094). Did you know that every day throughout the First World War a bell was rung at noon at Ellastone Church to remind everyone to think about and pray for all the local men who were away fighting in the War? 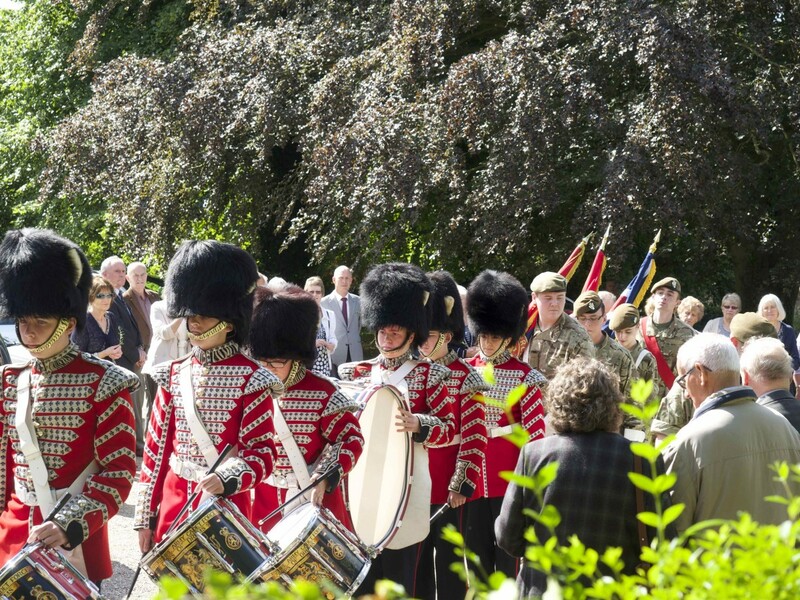 The.single bell was rung once again on Sunday morning, 3rd August to remind people to come to the churchyard to see the procession led by the Staffs and West Midlands Cadet Force Corps of Drums and to pay their respects to those who served and to those who lost their lives during WW1. Twigs of rosemary were left in remembrance. 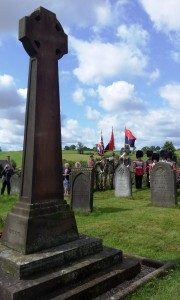 This was followed by the Drumhead Service. In Ellastone, we remember two heroes on April 25th. 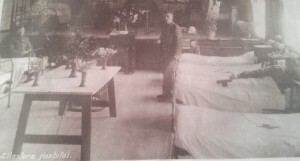 What was going on in Ellastone in September 1914? Read this article… Ellastone in September 1914 by Margaret Taylor. Due to popular request she has also included the recipe for the anzac biscuits that she made when the exhibition opened in St Peter’s. Many thanks to all those involved for the enormous amount of work! It is a great legacy to leave to the village.